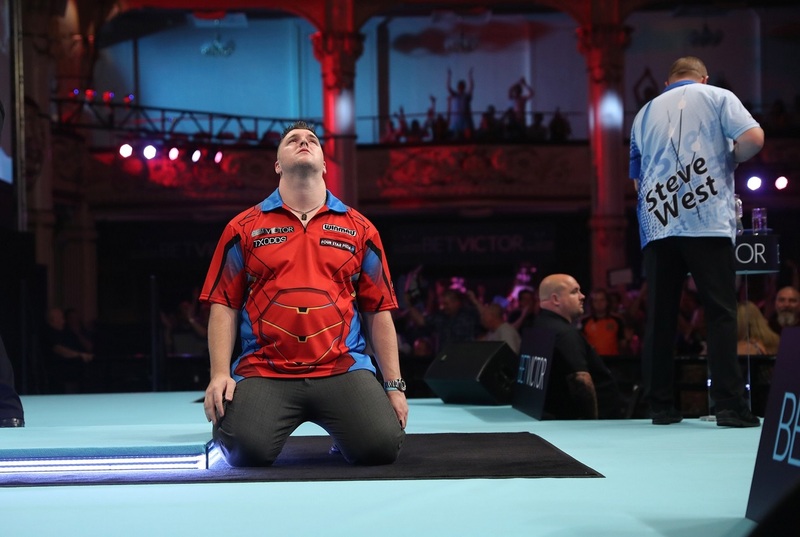 DARYL GURNEY secured a dramatic 12-10 victory over Steve West on day two of the 2018 BetVictor World Matchplay in Blackpool. 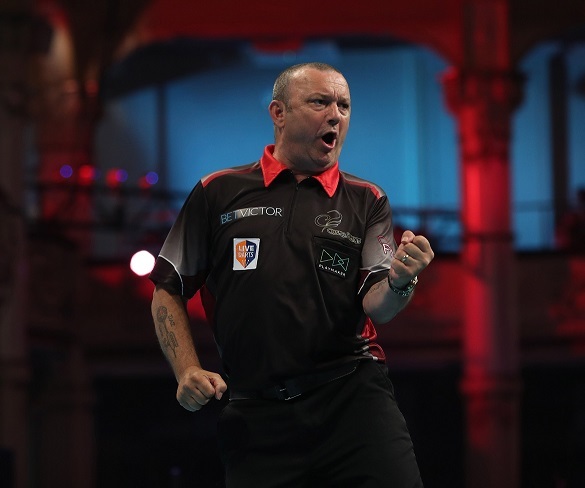 A high-quality double session at the Winter Gardens on Sunday peaked in the first game of this year's event to go to a tie-break as Gurney survived a huge scare to progress to round two. The 2017 semi-finalist survived 11 missed match darts from West to keep alive his quest to win the newly-titled Phil Taylor Trophy following a tense contest. The world number five held his nerve in the closing stages to set up a round two clash with Joe Cullen, and the World Grand Prix champion was visibly relieved to get over the line. 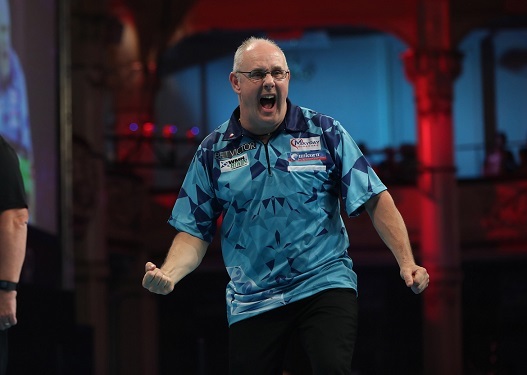 "I was very lucky to get the win, Steve was the better player in the latter stages," said Gurney, who is playing at the Winter Gardens for a third successive year. "I just wouldn't roll over, Steve kept missing and I kept punishing him. If I had nine lives I've used them all there! "I forced in the winning double and if I'd done that earlier I wouldn't have had to go through all that at the end. Hopefully I will make it easier on myself in round two." There was nothing to separate the pair throughout the first 15 legs, before West struck a crucial break of throw to make it 9-7. 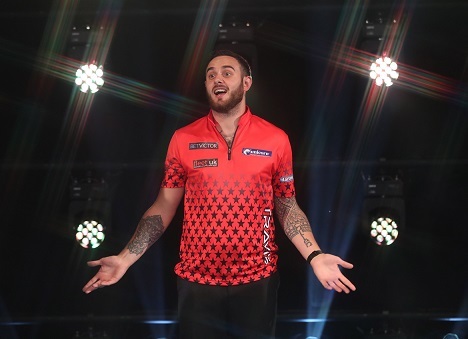 The following leg saw the Essex man squander seven darts to book his place in the second round as Gurney pounced to keep himself in the tie. West missed two more darts at double in the next leg as the Northern Irishman struck double 20 with his final dart in hand to stay alive once again. West regained the lead at 10-9 and then missed another match dart before Gurney hit a stunning 92 finish on the bull and then followed it up by taking the lead for the first time in the tie at 11-10. Cullen, meanwhile, secured his first win on the Winter Gardens stage with an impressive 10-3 demolition of number 12 seed Gerwyn Price. The Bradford man raced into a 5-0 lead, hitting a clinical four doubles from six attempts before firing in a stunning 170 finish, the highest of the tournament so far, to extend his lead to seven legs. Premier League star Price - who is set to undergo Achilles surgery next week - fought back to reduce the deficit to 9-3 but missed doubles to continue his challenge as Cullen found double eight to wrap up one of the biggest wins of his career. "It's a relief to win up there for the first time and I'm happy with the win," said Cullen, who is now set to break into the world's top 16 for the first time. "Gerwyn was struggling with his injury but it's my job to capitalise on that and that's what I did. My finishing was good and the 170 topped it off. "I haven't fulfilled my potential yet but time is on my side and it feels like the time for me to have a good run on TV." Two-time semi-finalist and fourth seed Gary Anderson struck five 180s in his 10-7 triumph over Stephen Bunting. With the game finely poised at 7-6 in Anderson's favour, the double World Champion fired in a crucial score of 177 and followed it up with a tidy 44 finish to take charge of the match at 8-6 before going on to secure the win in calm fashion. Despite never having progressed beyond the semi-final stage, Anderson is now the 3/1 favourite with sponsors BetVictor to win the tournament heading into his last 16 clash with Raymond van Barneveld. "I'm glad to get past the first around against a tricky opponent in Stephen who matched me for long periods of the game," said Anderson. "I was happy with my scoring and once I went ahead at 8-6 I felt comfortable and got the job done from there. "I'll keep plodding on and see how far I can go - it's well documented that this isn't my favourite tournament but I'll give it a good go." 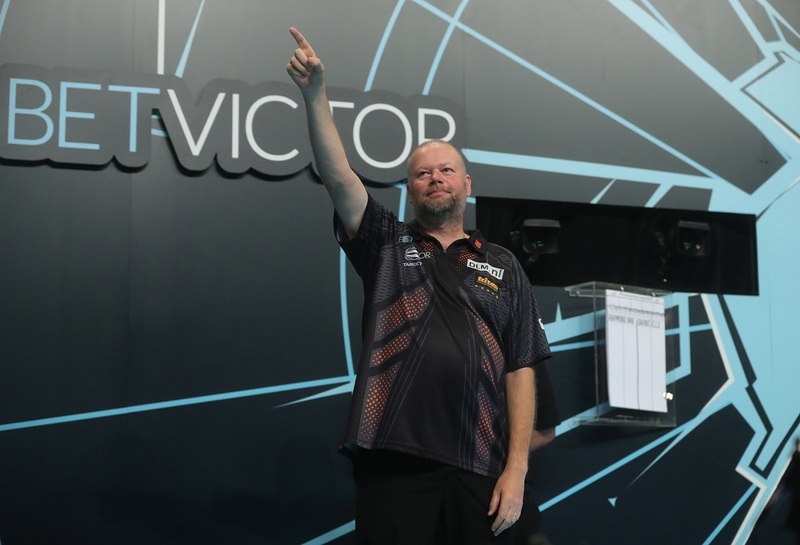 Van Barneveld rounded off the night with a 10-6 victory over Kyle Anderson as he returned from a six-week break in winning fashion. The 2010 finalist looked him top form as he raced into a 6-1 lead, but his Australian opponent showed his fighting qualities to go within two legs at 7-5. Van Barneveld did enough to keep Anderson at arm's length with a series of crucial finishes and almost wrapped up the win in style with a 154 checkout before pinning double ten with his next visit. "I was relieved to win in the end because I started thinking it wasn't going to happen today," Van Barneveld admitted. "I didn't feel comfortable for some parts of the game, I know Kyle can play a lot better than he did. I can produce better than this but I'm happy to be in the next round. "Against Gary I will have to be a lot better. To win games on this stage you have to play your A game but I will be fully focused in that game." 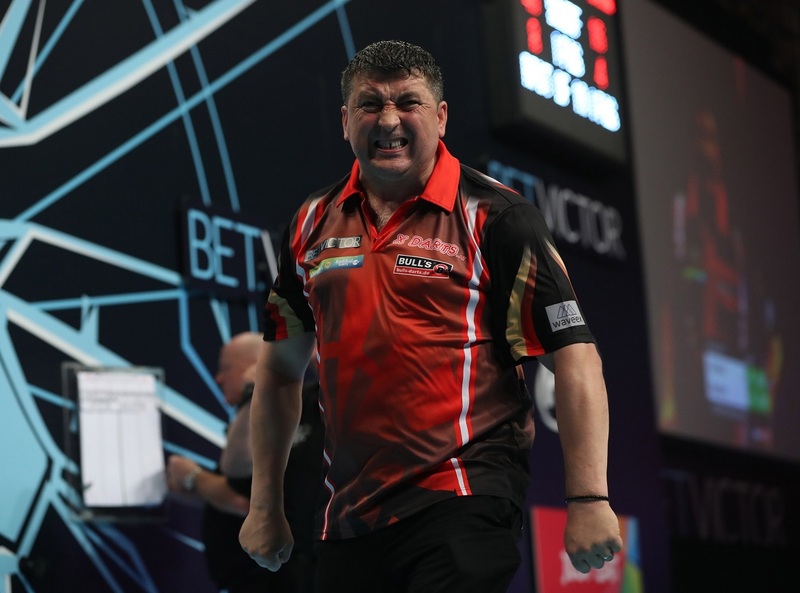 Two-time quarter-finalist Mensur Suljovic recorded his first win over Steve Beaton in nine attempts with a 10-6 success which included three ton-plus checkouts for the Austrian. The world number six struck impressive finishes of 120, 124 and 112 to go into a commanding 6-2 lead before Beaton reduced the deficit to 7-4. Suljovic continued his solid display to go within a leg of victory at 9-4, then squandered nine match darts as Beaton fired in a 120 checkout to stay alive at 9-6, only for the Austrian to finish the job on double 18 and advance to the second round. "I am over the moon to win that game, I thought Steve Beaton would retire before I finally beat him!" admitted Suljovic, who now meets Ian White. "I always give my best, there are so many good players in this tournament so it will be hard to win it but I will give it my best shot." White edged a close encounter with German debutant Max Hopp 10-7, firing in an impressive eight 180s and two ton-plus finishes. The 2015 quarter-finalist trailed 4-3 to Hopp before reeling off the next five legs - including a sublime 154 checkout - to take control of the contest. White missed six match darts to seal victory but eventually landed double eight to banish memories of his first round defeat to Rob Cross at last year's event. "Going into the match I knew I didn't have a good record against Max, we've had some good battles and that was another tough one," said White. "Now I have to make sure I play well for a full match rather than just spells - I need to start taking out finishes in one dart rather than three." World Champion Cross brushed aside Mervyn King to win an entertaining clash 10-5 as he began his second World Matchplay challenge in style. 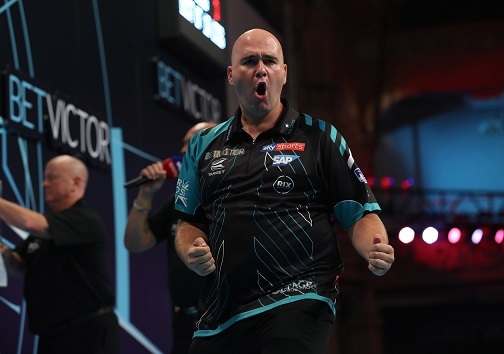 Fresh from reaching back-to-back finals on the World Series of Darts circuit in Las Vegas and Shanghai, the Hastings star settled into the contest with a superb 153 checkout in leg five to reduce the arrears to 3-2 following a strong start from King. The third seed produced his best darts as the game went on, hitting a crucial 80 finish to take a 6-4 lead into the second break followed by a 121 combination to take a commanding 8-5 lead. Cross rounded off the game in comfortable fashion to reach round two for a second successive year, where he will now take on Darren Webster. "I felt really, really good up there and I grew in confidence as the game went on," said Cross. "The 153 settled me down and after the first break I felt much more comfortable and I was able to play my near my best game. "It's always a tough game against Darren, he snaps at your heels all the way so I will make sure I am up for that one." Last year's quarter-finalist Webster produced a strong display to defeat World Matchplay debutant Steve Lennon 10-6 in the opening match of the day. The Norwich ace raced out of the traps to go 3-0 up, a lead which he never relinquished despite Lennon keeping pace with him throughout the tie. Webster found double top to head into the second break with a crucial 6-4 advantage, then hit double eight with his last dart in hand to go within a leg of victory at 9-6 before wrapping up the win in the following leg to seal his place in the last 16 for a second year in succession. "I had to make sure I was at my best with my finishing because with Steve if you miss he will punish you every time," said Webster. "I've got good memories from last year when I did well here and hopefully I can go even further this year if I improve from this game."